In general terms, the Romans coined the name 'Gaul' to describe the Celtic tribes of what is now central, northern and eastern France. The Gauls were divided from the Belgae to the north by the Marne and the Seine, and from the Aquitani to the south by the River Garonne, and they also extended into Switzerland, northern Italy, and along the Danube. By the middle of the first century BC, the Raurici were a minor tribe that was located on the outside of the corner formed by the Rhine turning eastwards towards Lake Constance, around the modern border between France's Alsace region and northern Switzerland. They were neighboured across the upper reaches of the Rhine to the north-east by the Latobrigi, to the east by the Helvetii, and to the west by the Sequani. The Raurici tribal name is an apparent brick wall when it comes to trying to break it down. There seems to be no meaning in proto-Celtic. The only way it makes makes sense is if the name is German. Then they would be '[of the, or like the] roarers'. But there is no record of an early Germanic influence in this region of Celtic territory, not even one that could be linked to the Belgae who were themselves influenced by Germanic language. The modern River Ruhr was then the Raura in its Celtic form, and the tribe may be named after the river, so then what does the river's name mean? The 'roar' or 'roaring river'? Again that would require a Germanic influence where there was none at this time. Curiously the nearby Seduni also appear to exhibit similar Germanic or Belgic influences. The only other realistic option for the origins of the name is that the original form of 'Raura' predated the Celts and they picked up the name when they arrived there. This may indeed be the case, but the name may still be German. Very little is known about prehistory in central Europe. The proto-Indo-European language split into a number of dialects, and it has to be wondered what territory was covered by the North-Indo-European language that eventually became German? When looking at a map of Celtic expansion one has to wonder whether Germans were shoved by them into Scandinavia from central and northern Germany. This could be the source of very early Germanic influences on names in Switzerland in at least two apparent cases. Little mention is made of the tribe, other than by Julius Caesar in his Gallic Wars commentaries. Their chief settlement is unknown, although it was likely to be the site of the later Roman colony of Augusta Raurica, or very close to it. 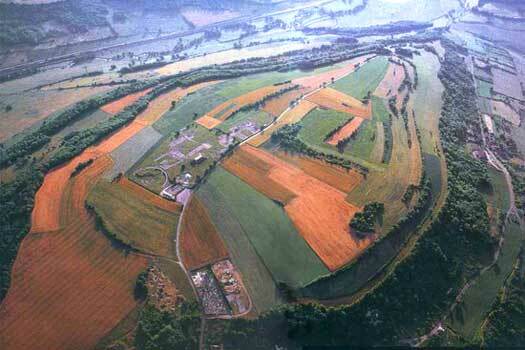 No archaeological evidence has been found to show Celtic occupation, however, suggesting that the oppidum was erased by the colony, or that an alternative site nearby has since been erased by the expansion of Basel. The colony was probably not entirely successful at first, as the Alpine tribes were not subdued until 15 BC. A wooden find dated to 6 BC has been found there, so occupation did resume or was continuous. By the second century AD it was a prosperous trading centre, but it was largely destroyed by earthquake in AD 250 and by the Alemanni around 260, with the surviving fragments going on to form today's villages of Augst and Kaiseraugst. The Helvetii are coming under greater pressure from migrating Germanic tribes who have now arrived to their north and are occupying territory on the east bank of the Rhine. They plan to migrate into the lowlands to the west, but their proposed path will take them through the territory of the Aeduii, a Roman ally, and the tribes in the way fear that the Helvetii will plunder and destroy as they go. Orgetorix of the Helvetii dies before the planned exodus can go ahead, but the tribe decides to stick to those plans. Aquitania seems to be their target, where they hope to tie up with the Boii who have settled there, close to the Atlantic coast. Julius Caesar recruits two new legions to face the threat, but groups from several local tribes join the Helvetii, including the Latobrigi, Raurici, and Tulingi, making them one of the largest and most powerful forces in all of Gaul. They also unite themselves to the Boii who have crossed the Rhine to assault the Taurisci. As the Helvetii and their allies depart, they burn their villages and any food stocks that cannot be carried. The statement is clear - they do not intend to return. After some skirmishing, the Helvetii and the Romans face each other at the Battle of Bibracte in 58 BC, just outside the Aeduii oppidum of the same name. The Helvetii are mercilessly crushed by the six Roman legions. Perhaps two thirds of their number, men, women and children, are killed on the day, while another 20,000 are killed in the subsequent pursuit. The shattered remnants of the Helvetii and their allies are forced back to their homeland, but having been greatly reduced, they will be unable to fight off Germanic incursions that could also threaten Gaul. Julius Caesar allows the relatively hospitable Boii to settle a buffer zone to the north of the Helvetii and east of the Aeduii, but even this shift leaves gaps for Germanic incursions, and one such incursion is already underway to the north. Caesar receives a federation of chiefs from tribes that include the Sequani, all of whom are suffering thanks to the Suebic invasion under Ariovistus. It is this campaign and its mixed outcome, despite victory in battle, that triggers Julius Caesar's campaigns in Gaul from this point onwards, which result in the eventual annexation of the entire land into the Roman state. As noted by Julius Caesar in his Gallic Wars, the Hercynian Forest (known to the Greeks as Orcynia) is home to a mixture of Germans and a once-powerful arm of the Volcae Tectosages. The forest lies on the east bank of the Rhine (this forms the northern border of the lands known to the ancient writers of the Mediterranean, and the modern Black Forest forms its western part). Its breadth is such that it takes a quick traveller nine days to cross it through uncertain paths, as there are no known roads. It begins at the frontiers of the Helvetii, Nemetes, and Raurici, and extends in a line along the River Danube to the territories of the Daci and the Anarti. From there its borders twist northwards into the vast lands that have not been charted by the Mediterranean cultures. While Caesar is tied down in Rome, the Gauls begin their revolt, resolving to die in freedom rather than be suppressed by the invaders. The Carnutes take the lead under Cotuatus and Conetodunus when they kill the Roman traders who have settled in Genabum. News of the event reaches the Arverni that morning, and Vercingetorix summons his people to arms. 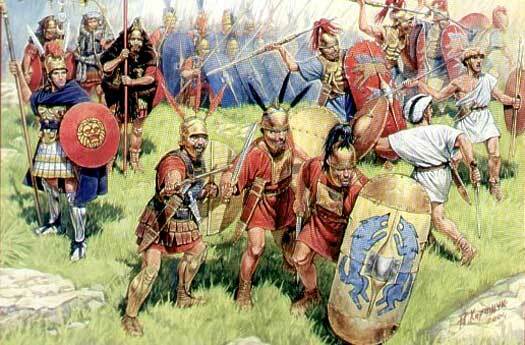 Despite some successes, the main Gaulish army is forced to retreat. Four relief forces amounting to a considerable number of men and horses are assembled in the territory of the Aeduii by the council of the Gaulish nobility. Men are demanded from the tribes of Gaul, and substantial numbers are sent by the Boii, Boiocasses, and Raurici. Together they attempt to relieve Vercingetorix at the siege of Alesia, but the combined relief force is soundly repulsed by Julius Caesar's remarkable strategy of simultaneously conducting the siege of Alesia on one front whilst being besieged on the other. Seeing that all is lost, Vercingetorix surrenders to Caesar. The garrison is taken prisoner, as are the survivors from the relief army. They are either sold into slavery or given as booty to Caesar's legionaries, apart from the Aeduii and Arverni warriors who are released and pardoned in order to secure the allegiance of these important and powerful tribes. A former officer under Julius Caesar during the conquest of Gaul, Lucius Munatius Plancus, now proconsul of Gallia Comata, founds the colony of Augusta Raurica inside Raurici territory. It is located approximately twenty kilometres east of modern Basel and is the earliest-known Roman colony on the Rhine. Today the colony's ruins survive as an archaeological site that also serves as an open air museum in Switzerland, close to two villages that still bear part of its name - Augst and Kaiseraugst.